A small country in Southeast Asia, area 181,035 km², population approximately 16 million. One of the poorest countries in Asia. Ravaged by decades of civil war. A quarter of the population was wiped out in the 1970s as a result of the policies of an extreme communist regime. 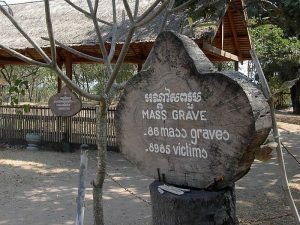 Origin of the term killing fields, where innocent men, women and children were beaten to death. A country with no inhabited towns, no personal possessions, no money, no schools, no health care, no religion, no trust, no hope. A country where enemies of "the organisation" were betrayed and exterminated, where parents witnessed their babies being battered to death, where the condemned had to dig their own graves. 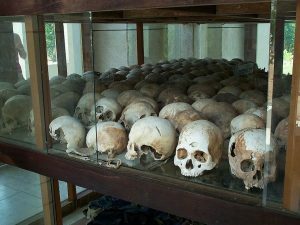 A country where at least 1.7 million people died in four years as a result of starvation, disease and execution. A third of the population are in multidimensional poverty (household deprivation in education, health and living standards). Many children leave school before they reach the age of 15. A culture of impunity and corruption denies justice to the poor and oppressed. Betrayal, often by friends or relatives and even by children, has left many unable to trust. Recovery of former, highly held values, such as the responsibility of grown-up children to care for elderly parents, has been slow. Religious beliefs were repressed, believers persecuted or executed, and places of worship destroyed or desecrated by a brutal communist regime. Poverty and the desperate need to survive have fuelled corruption. The gap between the very rich and the very poor becomes ever wider. Crisis: an unstable situation of extreme danger or difficulty. 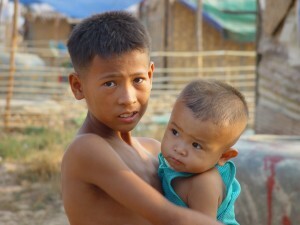 For more than a decade Cambodia was refused development assistance by western governments. Nearly 20 years of insurgence soaked up scarce resources and hindered recovery. Inconclusive election results, political instability and an under-resourced civil service have held back development. 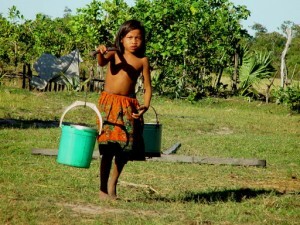 The rural poor have suffered as a result of floods, drought and deforestation. Cambodia is not expected to be clear of landmines until at least 2025. Cambodian Communities out of Crisis (CCC) was born out of one man's compassion for the people of Cambodia. We are a Christian organisation, working in partnership with the growing Christian church in Cambodia, but aiming to provide humanitarian assistance to people of all religions in that country. We support Awana Cambodia in their mission to establish discipleship groups for children and young people. We are involved in education, providing sponsorship for children to attend good-quality schools in Cambodia. CCC's vision is for the establishment of a Christian college and business institute in Cambodia. CCC is a non-profit organisation, based in the United Kingdom, registered as a charity (number 1062205) by the Charity Commission. CCC is a member of Global Connections. 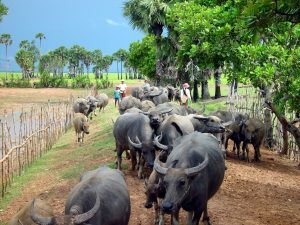 If you need any further information about Cambodia or about the work of CCC, please contact us. CCC relies on donations to finance its work. We have no salaried employees in the United Kingdom and all our activities are carried out by volunteers. As a result, our overheads are low and as much as possible of the money we are given is sent to Cambodia, where it is most needed. If you would like to help the people of Cambodia through CCC, please go to our Giving page and choose the way of making a donation that suits you best. If you are a UK taxpayer, please consider making a gift by Gift Aid or another tax-efficient method. Tax recovered on gifts made by Gift Aid helps cover our administrative costs. If you belong to a church, home group or club in the UK, and you think that other members would like to hear about Cambodia and CCC, please contact us to arrange a visit and audio-visual presentation. Thank you for your partnership in our work!